Static tensile tests are frequently presented at extremely low strain rate [10- 6 mm/mm (sec)] and variations permissible in conventional testing machines are commonly so restricted such they do not influence the static properties. However machines able of varying strain rate via as much as 100,000 times have been enhanced and tensile tests in those machines has disclosed that tensile properties are rather susceptible to changes beneath increasing strain rates. Generally it is observed that ultimate tensile strength and yield strength increase along with increasing strain rates, percentage elongation observes to first increase along with strain rate except then decreases of keeps constant. One significant influence of high strain rate is that for that material as low-carbon steels such do not show yield point in common tensile tests, yield point appears. 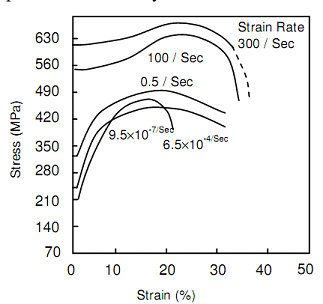 Furthermore, yield strength out of all static properties is not affected via strain rate. 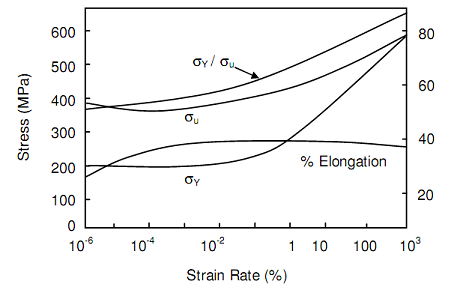 Figures of Stress-Strain Diagram for Mild Steel at different Strain Rates and Effect of Strain Rate on σY, σu and % Elongation, show how these properties are influenced via strain rate. The effect of strain rate upon mechanical properties becomes extra pronounced at elevated temperatures.The load applied at strain rate higher than 10 mm/mm (sec) is categorize as impact load, and beneath impact loads ductility of a material has tendency to decreases.